Steve Jobs repeatedly professed Apple’s love for its customers during the company’s short-notice iPhone 4 press conference last Friday. This love is why Apple will soon offer free iPhone 4 Bumpers to appease early adopters who are upset over the handset’s antenna design. Incipio, a third-party accessory maker, says it loves its customers too—and the company wants to prove it by capitalizing on the free Bumper bandwagon. Incipio on Monday announced its “We Love Our Customers Too!” Bumper Trade-In Program. The short of the long is: you send Incipio your Apple iPhone 4 Bumper (which you presumably will obtain for free soon), and it will give you $5 off any Incipio product from its online store. Once Apple starts giving Bumpers away for free, they won't get you much on eBay. 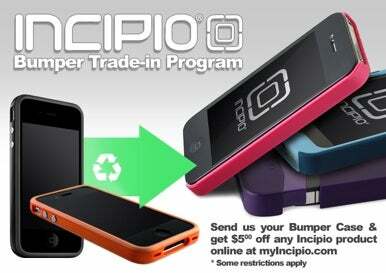 So if you don't like your Bumper, it can get you around 20 percent off an Incipio case you do want. To qualify, you simply need to fill out the form I linked at Incipio’s site to receive a $5 coupon by e-mail. In fact, the company is essentially asking applicants to send in their iPhone 4 Bumpers on Scout’s Honor. If you want to get in on this, be sure to apply soon. Incipio’s program ends on August 30, and Jobs said last week that Apple would launch its free iPhone 4 Bumper program later this week.